Tape measures in the U.S. mostly utilize Imperial measurements, which means that you measure in feet, inches and fractions of inches. 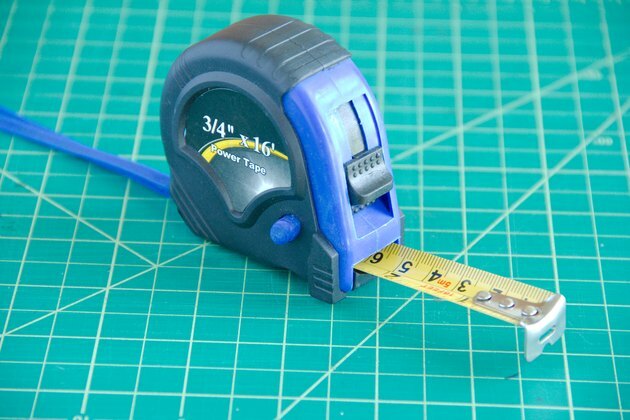 When using a metric tape measure, the measurements appear in centimeters, millimeters and, sometimes, meters. But not all tape measures are alike. While some only contain Imperial measurements, you can also find some with both measurements combined on one tape. A dual tape measure contains the Imperial measurements on the top half of the tape measure with the metric ones below—or their positions may be reversed, depending on the model you buy. Stretch out the tape measure. Just beyond the tip, bold black numbers begin with the number one and continue consecutively. Each number equates to 1 inch, and 12 inches equal 1 foot. Across the top of the tape, above the number 12, is a black 1. This indicates 1 foot. Beyond the black number 1 you might find a red number 1; this represents an inch, and the red numbers continue consecutively to the number 11. This pattern repeats every foot on the tape measure, allowing you to measure in feet and inches. Some Imperial tape measures also have consecutive inch numbering along the bottom. This allows you to measure in inches only. For example; a 12-foot tape measure also equals 144 inches. When you measure an object, the tip is included in the measurement. It is exactly 1 inch from the edge of the tip to the number 1. Likewise, if you hook the tip over the end of a board, for example, the tip pulls out slightly to account for its own thickness, giving you an accurate measurement. Look closely at the tape measure. You will notice that there are black lines, or hash marks, between the inch markings; these signify fractions. The longest hash mark represents 1/2 inch and is always halfway between the inch numbers. 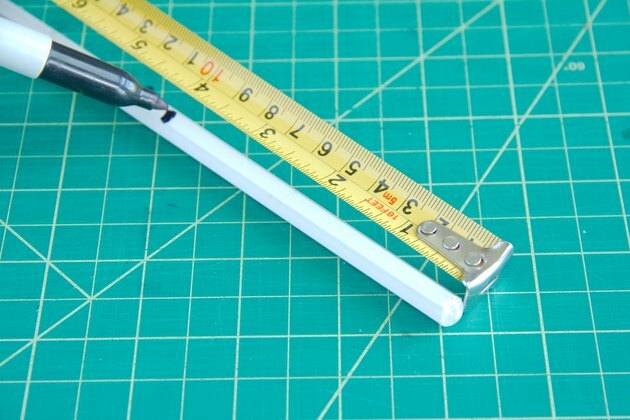 Slightly shorter than the 1/2-inch mark are the 1/4-inch marks, indicating 1/4 or 3/4 inch. The next smallest is 1/8 inch. The 1/16-inch hash mark is the shortest on many tape measures; however, some have an even shorter mark noting 1/32 inch. These rules include three hash marks between the inch and 1/8-inch marks. Counting the smallest hash marks is tedious. An easier way to use them is to look at the nearest larger hash mark and convert it to sixteenths, then add or subtract 1/16. For example, 1/2 inch equals 8/16. If something measures one hash mark beyond the 1/2-inch mark, it is 9/16 inch. If it measures one hash mark before the 1/2-inch mark, it is 7/16 inch. 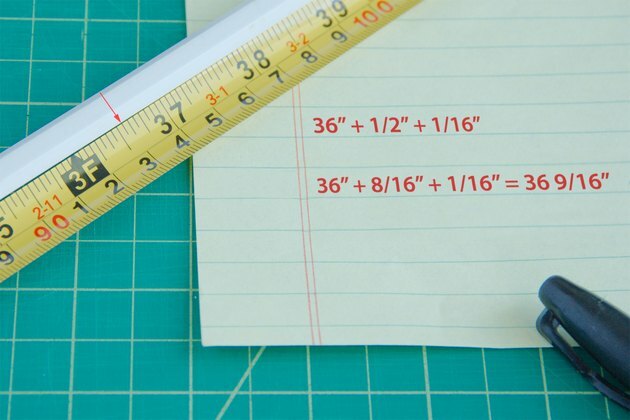 A 1/32-inch rule offers a bit more precision, and you convert the measurements using the same technique. The number 9/16 converts to 18/32. If something measures one mark beyond the 9/16 mark, it is 19/32 inch. Like Imperial rules, metric tape measures have hash marks of different sizes. The standard numbered unit is the centimeter. Each centimeter contains 9 hash marks indicating millimeters. There are 10 millimeters in 1 centimeter. The millimeter marks typically are the same length, except for the middle one, which readily identifies 5 millimeters. Metric tape measures often use special symbols, such as red numbers, for every 10 centimeters or 100 centimeters (1 meter), but often do not have a unique symbol for each meter. 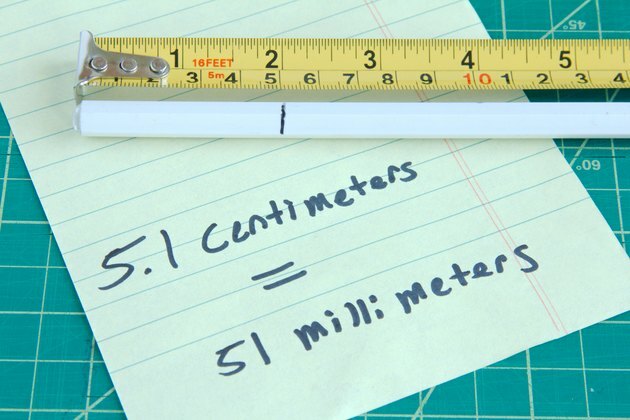 If you have an object that measures longer than a whole centimeter, you will write your measurement as a decimal, such as 5.1 centimeters, or as 51 millimeters. This means that your measurement is 1 millimeter longer than 5 centimeters. 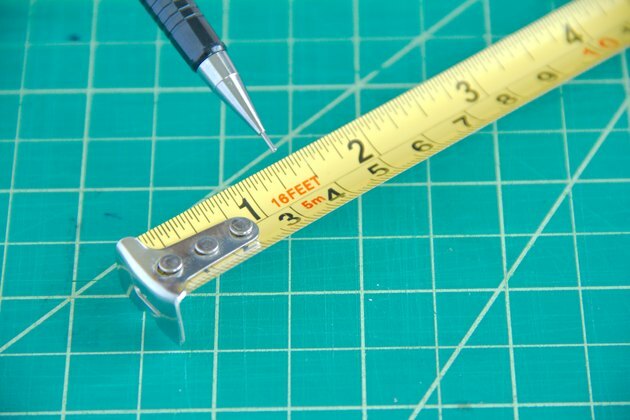 Your measurements will either be centimeters or millimeters; they can't be both.